A few hours after Beck spoke, my review of his talk was posted on MRM’s website. When I visited LU a couple of weeks later to attend my daughter’s graduation, I was able to speak with Johnnie Moore, the senior vice-president for communications and the assistant to the president at LU, about my concerns regarding LU placing Glenn Beck in its “pulpit,” as well as Moore’s concerns stemming from my critique. Here I continue what I began in Part 1 of this article: A discussion of Moore’s main objections concerning my critique, followed by my responses. LU’s reputation should be enough to show that their motives are good. Reputation can only go so far. For those over 40, remember New Coke? It replaced the regular Coke recipe back in the 1980s. This was a marketing nightmare, and within a year “Classic Coke” (containing the old formula) started to hit the shelves. Before long, “New” Coke was history. I worked in a grocery store at that time, and I remember the ridicule Coke received for this bad judgment. Pepsi used its “Pepsi Challenge” to practically double its sales at our store that next year. Yes, public perception is important. On the day before I met with Moore, I spoke to more than a hundred people at a local evangelical Christian church on the topic of Mormonism. 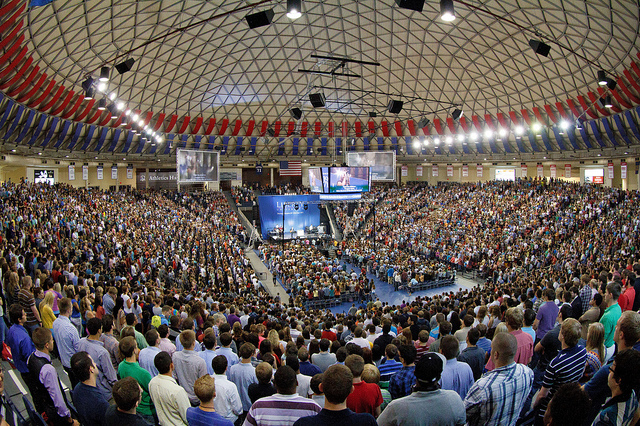 Before the service, a man about my age came up to me and, without me bringing up the topic, asked, “Should I send my 16-year-old daughter to Liberty?” Like me, he was bothered about Beck’s on-stage appearance at Liberty University. At the end of my talk, I took questions from the audience. Guess what the first question was about? 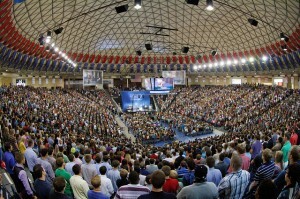 Obviously, it was Glenn Beck’s talk at LU. Nobody was prompted. I must add that, while LU did receive a $50,000 gift from Beck’s nonprofit organization, it should be pointed out that this amount doesn’t even pay half the tuition for one student who would attend Liberty for four years. Allowing LU’s reputation to be sullied, possibly causing the school to lose potential students, is a bad move for a university that is very active in recruitment. Even losing 5 or 10 students is a shame and unnecessary! And while Beck’s appearance could keep some from sending their children to Liberty, how many potential students will enroll at LU merely because Beck spoke there? How about none? Liberty officials need to understand that many who belong to their school’s target audience don’t think this is a peripheral or unimportant issue. LU administrators were surprised that Beck talked about Mormonism. Shouldn’t this alone be enough to tell the school’s leaders that they should avoid inviting someone from another religion to address the student body? The school doesn’t require its speakers to give details about their content beforehand. Should it be a surprise when a Mormon is allowed to take the stage and then makes it appear that Mormonism is just another “denomination” of Christianity? When I asked if Beck would ever be a speaker at Liberty again, Moore was noncommittal. Has no lesson been learned? Moore told us that he has met with Beck behind closed doors and is impressed how (and I quote) “he talks like a Christian.” Should this be a surprise? Of course, Mormons use the same language as Christians. This is the problem in allowing Beck to address the students in the first place! Remember, he is the one in his talk who very clearly stated that he was a Mormon and admitted that his differences would probably go against what most officials at Liberty thought. He is the one who called Joseph Smith a martyr and referenced preexistence. While I certainly hope and pray that Beck eventually becomes a believer in the Christ of the Bible, LU should not have let its guard down by allowing potential confusion to reign in the hearers of his message. In other words, because the student body—remember, some are as young as 17—has taken two Bible classes and two theology classes (would you consider four classes “many”? ), there is apparently no need to worry about possible cases of students jumping ships. It should be pointed out, though, that the topic of Mormonism is not brought up once in any of those classes. This information comes not only from my daughter but a senior member of the LU Bible department. Bible majors are able to take a class in the cults, but few outside the Bible department ever take the class. Having taught Bible classes at both the high school and college level, I can attest that a total of four classes (with no specific training on LDS doctrine) is inadequate to prevent someone from joining the LDS Church sometime in the future. Besides, I have known folks with Ph.D.’s who were left confused by the similar-sounding teachings of Mormonism. LU’s thinking on this is, at best, naïve, and at worst, reckless. There is more that could be said. While this blog will not reach the audience of my original article, I want to reiterate that LU made a terrible mistake by allowing Glenn Beck to speak at convocation, regardless of the school’s defense of this decision. If the school wants to continue allowing nonbelievers to man the stage at convocation, then I recommend that no worship music or prayers are included in these particular services. Why confuse the issue if the intention is for LU students to hear different perspectives? (This is not a bad policy, as long as it’s clear what the purpose of the convocation is.) In addition, I suggest that LU should not require students to attend these particular convocations and thereby not enforce the $10 fine currently assessed to those who miss. It’s a shame that there is such controversy at what is, I believe, a fine school that really does have top-notch programs. For the sake of training champions for Christ, please, Liberty officials, consider a change in philosophy. This entry was posted in Truth, Honesty, Prayer, and Inquiry and tagged Church of Jesus Christ of Latter-day Saints, Glenn Beck, LDS Church, Liberty University, Mormon Church. Bookmark the permalink. A “closet Christian”? The New Testament knows of no such beast. Speaking from my own experience and that of others, when one is born-again and given new eyes to see the teachings of mormonism are seen as abhorrent. One cannot be a regenerate follower of Christ and remain in a religious organization that denies Him. This entire fiasco is driven by a religious culture that is losing influence and is therefore willing to compromise the truth to be unequally yoked with “enemy of my enemy is my friend” unbelievers. There is no shame in admitting that Liberty made a mistake but there is shame in trying to excuse welcoming a pagan unbeliever to proselytize Christians. I’ll say again that I have no problem with Beck speaking. I think it was a mistake for the university to offer a response of sorts to point out some of the things Beck said are not necessarily true and don’t represent the views of Liberty. Arthur, buddy………….where have you been? You need to stop in now and again and share your testimony with those seeking answers regarding the LDS religion they are apart of. Say folks, didn’t “Jude” address this topic. I seem to remember him writing about folks who had sneaked into the fold but were really enemies of the Gospel of Jesus Christ. In his letter he then says that these folks need to be exposed, if memory serves me right. He does a little walk through the Bible talking about those who attempted to corrupt God’s message. Check out his metaphors describing these folks. Now what I’m trying to determine is if we can apply Jude’s characteristics to Beck or LU. I guess maybe both. There is a price to be paid for earnestly contending for the faith. In our modern culture, if we don’t “celebrate” other people’s deal, we are condemned and ridiculed. The more that Glenn Beck speaks, the worse it is for him. Let him talk. But they should have someone up there who can refute his falsehoods and it should be done right then and there. The problem is that the LDS church is well practiced at evading and obfuscating. I think that the whole world should be evangelised to by Mormon missionaries. I bet the global population afterwards would not break 0.1% adherence to Mormonism. Mormonism is so ridiculous, so demonstrably false, the temple is so absurd and every aspect of life that revolves around it is so authoritarian and Christ-less, that the number of people the world over living in the information who choose to keep their head buried in the sand and be a Mormon is a negligible demographic at best. However, what is bad about this is that some Christians will walk away from this thinking that Mormons are a denomination of Christianity. All this will come out in the wash though as they eventually encounter correlated Mormon doctrine from members and missionaries. Let this antichrist spread superficial information and lies of omission, but when the rubber hits the road the smoke and mirrors will vanish. And the Christians who allowed for and made this happen will have to answer for it on that day. I’ve been surprised in my years posting on MC how many Mormons will show up arguing that when it comes to Mormonism and Christianity we’re talking about the same God and the same Jesus. Andy Watson was telling me about a guy he knew who had been a Mormon convert and that prior to going through the temple the bishop and another rep. called on him and broke the news about the LDS doctrine of God. He was blown away. He had no idea what the religion was really all about. So MT, out of the number of people the LDS church claims on their rolls, how many are full-blown temple Mormons? I’ll bet it’s not 25%. My guess is that MAYBE the LDS church might hit 25% of active members as temple Mormons. I’m not talking about temple recommend holders. I’m talking folks who are really into it full bore. The LDS church has different levels of commitment and I’ll bet the number of social Mormons is the largest group. organizations behaved in public discussions with those they talked to was quite the contrast. Mormon spokesmen usually denied some of the ” unique” doctrines their leaders have taught. about currying the public’s favor to accept them as another christian denomination etc . influence people to accept Mormonism as the only true church of Jesus . Either Beck doesn’t know Mormonism or he’s playing the LDS game. After all, it’s easy to stand up and give a rousing speech and talk about the atonement or even throw out the “Jesus is my Savior” line. Why not? It’s not unusual for people to join up with the LDS sect and not know what’s up because the MM are hot to get people baptized. So if a LU student were to ask Beck after his presentation, “So we believe the same thing, right?”, what would Beck say. Well it comes down to what he knows about the history of Mormonism and especially about the LDS sect. Jesus said that many would come in his name but don’t be fooled. Not everyone who says “Lord, Lord” has a regenerated spirit based on being born again by the Holy Spirit. Am I just being too picky? I don’t think so. We don’t do Mormons any favors by giving them the benefit of the doubt regarding their spiritual condition. Faith isn’t all that complicated however having a clear picture of who Jesus is, is relevant. So was Glen Beck playing games at LU? Maybe he’d consent to be interviewed by MRM and clear the air. Is Glenn Beck stupid? Is Glenn Beck naive? Is Glen Beck uninformed or misinformed? Is Glenn Beck a flim flam man, a con artist, a true believer of and mimic of Joseph Smith. Well I don’t think Beck is stupid. He appears to have at least average intelligence and the ability to communicate and articulate an idea. Naive? No. Uninformed or misinformed? I doubt it. A con man? Perhaps. But I think more accurately, Beck is a true believer in Joseph Smith and his restored gospel. Like a lot of Mormons though, Beck makes Mormonism into what he feels comfortable with. What Beck doesn’t get however, is that a person can’t embrace LDS doctrine and at the same time be a Christian, embracing Christian doctrine. It won’t work. Beck may have conquered cognitive dissonance just like so many other Mormons do. These folks can hold two contradictory thoughts in their heads at the same time and not see the conflict. Yea, I’d say true believer. It is dishonest however. This is all very interesting in the fact that I have spoken to a number of Trinitarian Christians from different denominations – ie Lutheran, Baptist, Pentecostal, Anglican, Catholic and ones that call themselves Evangelical, and when I explain to them that we believe that Heavenly Father and Jesus are separate beings and both have physical bodies many still say that I am a Christian because I believe in and follow Jesus. They are quite willing to leave the differences as they sit. The main ones that try to say I am not are the Born Again Evs and the Baptists. But its nice to see people doing Satan’s work for him in reference to Jesus teaching about the wheat and the tares – trying to pull out the tares before Jesus returns on the Day of Harvest. Who knows how many ‘Christians’ within any denomination you will lose by doing that – I am talking about the ones who become Atheist because you are not seen by them as giving a ‘better’ alternative? You can teach them about the differences in beliefs, which we LDS do, and try and teach them that your’s is the only true interpretation, which we LDS do; but we do not say that you don’t believe in Jesus and are not Christian, just you dont believe correctly in Jesus and thus are not true Christians, for want of a better word. Ralph, what a load of nothing. I am sure a number of Methodists and Anglicans don’t have a strong opinion on the matter. Others may not know more of Mormon teaching. Your non-specific anecdotal stories prove nothing. Your point on the tares is interesting only because it seems to infer we are not to correct or spread the good news. I guarantee if you laid it all on the table, those same Christians you claim to talk to would flat out tell you that you are not Christian. I would guess you’re about as dishonest with those numbers (?) of Christians you say you interact with as Glen Beck was at LU. It’s the way you LDS folks are wired. I’d say Kate has pretty much nailed it regarding your interactions. What in the world do you mean by this? Typical LDS thought process. Do you think there will be some sort of roll call of the denominations at the Judgement Seat of the Lamb? These souls belong to Jesus. They don’t belong to some religious denomination. But there in lies the problem with the LDS sect and their thinking that there must be a “one true church”. We’ve been over this countless times with you but here we go again. The Mystical Body of Christ is made up of those who are born again by the Spirit of God through faith in Jesus Christ. This is the Jesus that is revealed in the Bible, not the impostor that Joseph Smith created. Smith’s Jesus cannot save anyone let alone make someone a god. For those who become atheists, whose responsibility is that? They certainly heard the message. Is it the responsibility of a denomination to make someone believe? Two thirds of those on the rolls of the LDS church are inactive. I would say your sect is doing a poor job of doing what you are accusing Christian denominations (of doing). You know how I got saved Ralph? The Holy Spirit convicted me of my sin. I repented and received the gift of forgiveness and eternal life through putting my faith and trust in Jesus. I don’t know why you don’t get it. We’ve preached the gospel over and over to you and you reject it. So is that our responsibility? We’ve sown the seed. Jesus talked about the ground the seed falls upon. It appears to me Ralph that you are the hard ground by the side of the road! thats great Ralph, but let me ask you some questions. 1. Whats what you said have to do with the topic at hand? 2. You mention many different groups that you claim to have spoke to, can you prove this? or do we just take you at your word? 3. Did you purposely seek out all these different groups and ask them the question of, I Ralph am and LDS member and I do not believe in the Trinity, instead I believe in 3 separate Gods, would you say I am still a Christian since I believe in God and Jesus? Then they all said yes to you. 4. Lets just say you did do what I pointed out in number 3, did you know that Jesus said to people who claimed that they knew the Bible, that they in fact were in error and did not really know the scripture. 5. You seem to believe people who tell you what you want to hear, they claim your a christian, so they must be right, we claim your not so we must be wrong, it takes more than that to prove truth. What evidence do you use to prove them and you are correct? You remind me of an atheist friend of Mine, I told her according to Ezekiel chapter 38-39 China and Russia will march upon Israel, she told me she knows a Christian who denys that and claims it will never happen. So I pointed out to her, why is it I claim to be a christian and read my Bible and you reject what I say, yet you find a so called Christian who agrees with you, so then that makes them correct. Funny how that works. Ralph, that is a flat out lie. Me and Falcon have said over and over and over, tell us where we are wrong, flat out tell us what you believe and how we are different. As of yet no mormon will do that. So much for being honest. I’ve often recounted the story Andy Watson told me of going to a Sunday morning class at a Mormon church and when it came time for questions he introduced himself, said he was a born again Christian having had received Jesus as Lord and Savior through faith and given that, what could the LDS church do for him? The elderly gentleman leading the class replied, “Nothing”. Well at least the old guy was honest which is what we can’t say for most LDS who are either very ignorant of the history of their church and what their leaders have taught or have learned to avoid questions all together. These Mormons can’t really tell us what the restored gospel is suppose to be since there are so many different sects teaching things that are diametrically opposed to one another. Given that Mormonism provides a moving target of contradictions and ever changing doctrine, it appears that the restored gospel of Mormonism is what anyone wants it to be. Funny how they can all claim to be what the first century church believed, taught and practiced. I think Mormons need to get a copy of a good history of the first four hundred years of the Christian church. What they won’t find is any Mormonism. That’s because it never existed thus the premise for Mormonism is phony. A couple of ideas I got out of Becks’ talk was read the scriptures and humble yourself when times get tough. Which of these is different from what a Christian would do or need to do? christian should do . So everyone who is patriotic should be viewed as a christian ? and they happen to believe that Jesus is not God in human flesh or that He rose from the dead. He established through His apostles 2000 years ago , now restored ? Or perhaps looking at ” MormonISM ” as opposed to ” Mormons ” etc . What is with you LDS folks and your “humble” line. That seems to get pulled-out a lot. To my way of thinking, to the LDS church, “humble” is another way of saying “submit” to the leadership, they’ll never lead you astray and once they’ve spoken, the thinking has been done. When you use it here I think it’s gratuitous on your part. Isn’t “pride” a big problem with Mormon priesthood holders who believe they are endowed with special spiritual power and will become gods through their works? I think the “humble” line is also a way of sounding spiritual and is just another attempt to disarm Mormonism critics. It’s just part of the crooked talk that takes place in this dysfunctional religious system. You need to humble yourself clyde and come to Jesus in faith so that He might refresh your spirit and bring you into everlasting light at the end of your days. Humble means to set aside your notion of becoming a god and submitting yourself to the King of Kings and Lord of Lords as the One True and only God. in being a member of a religious organization which is run by false prophets ? ( see Matt 24:11) . constitutes the church of the Devil in these days . Of course Mormons like Glen Beck will not tell his audience these teachings . Why? salvation ( Gal 1:8 ) . MormonISM is not the way . The Mormon church is not the only true church of Jesus Christ. That’s the bottom line . Who are you trying to convince that the majority of Christians believe Mormons are a Christian denomination: us or you? The only Christians I know of who would shrug off what you mentioned are Christians who I wouldn’t even consider Christians in the first place. And as a former Evangelical now Lutheran living in the Bible Belt I can testify that those are far and few between. But I guess it’s my experience against yours, I believe that are being selective in your experiences is all. Why the theological reductionism? Muslims—like Christians but unlike Mormons—believe that there is only one God. Why don’t we just leave our differences there? Are you trying to convince us or you that fundamental differences are irrelevant?